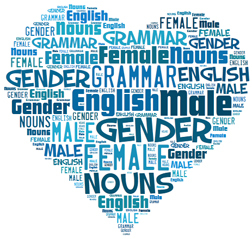 Home » Literature » Did English used to have gendered nouns? … Yes! If you speak another language like Spanish or German, you’ll be familiar with grammatical gender. In Romance languages (and many others), nouns have a gender. In French, a chair is la chaise, a feminine noun, and a hat is le chapeau, a masculine noun. But did you know that English used to have gendered nouns too? genders were lost because of the language mixing that went on in Northern England between Old English and Old Norse … in order to simplify communication, gendered nouns simply disappeared. However, in northern England in the 1100s, grammatical gender disappeared. Historical linguists aren’t entirely sure why this happened, but it has been suggested that genders were lost because of the language mixing that went on in Northern England during that time. Between the 700s and the 1000s, there were Vikings invading northern England where the Anglo-Saxon peasants lived. The two groups spoke different languages: Old English and Old Norse. However, it is quite likely that many people were bilingual and fluent in both languages. Both Old English and Old Norse had gender, but sometimes their genders contradicted each other. In order to simplify communication, gendered nouns simply disappeared.